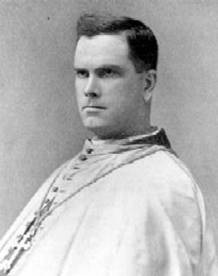 Judging from his photograph, Lawrence Scanlan, first Catholic Bishop of Utah, was not a man to be trifled with, and perhaps that was a factor that helped him get along with Mormons so well as he established Catholicism in their Zion. Not long after Father Scanlan arrived in Utah, he was invited by the Mormons in Saint George, Utah to use their tabernacle to say Mass. They even supplied a chorus that could sing Latin High Mass! It is easy to assume that in the 1850s there was only one issue in American politics, slavery. This is of course incorrect, there were many issues, most forgotten now that attracted attention of voters and politicians. One hot issue in 1857 was Utah and the on-going conflict between the Federal government and the Mormon settlers. The issue was addressed in Springfield, Illinois in June 1857 in separate appearances by Stephen Douglas and Abraham Lincoln, both warming up for the Senate contest in 1858. It is easy to forget that the Mormons had a sojourn in Illinois, until they were chased out after the murder of Joseph Smith on June 27, 1844. 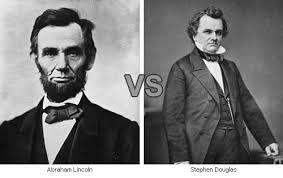 Stephen Douglas was usually on friendly terms with the Mormons, he and Smith both being native Vermonters. 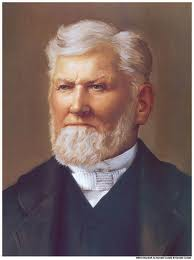 Smith predicted that Douglas would run for President one day and would win, unless he became unfriendly to the Mormons. Lincoln represented both Mormons and non-Mormons in lawsuits against each other and in 1840 in the state legislature voted in favor of the incorporation of the Mormon town of Nauvoo, which granted unusually broad powers to the Mormon controlled town government. Nauvoo at the time rapidly became the largest city in Illinois, and Smith and his co-religionists were a subject of considerable controversy in Illinois that eventually broke out into open war between Mormons and anti-Mormons. By 1857 the Mormons, and their polygamy, were no longer a local issue in Illinois, but were definitely a national issue. Mr. President, I will now respond to the call which has been made upon me for my opinion of the condition of things in Utah, and the appropriate remedy for existing evils. , The Territory of Utah was organized under one of the acts known as the compromise measures of 1850, on the supposition that the inhabitants were American citizens, owing and acknowledging allegiance to the United States, and consequently entitled to the benefits of self-government while a territory and to admission into the Union, on an equal footing with the original States  so soon as they should number the requisite population. It was conceded on all hands, and by all parties, that the peculiarities of their religious faith and ceremonies interposed no valid and constitutional objection to their reception into the Union, in conformity with the federal constitution, so long as they were in all other respects entitled to admission. Hence the great political parties of the country indorsed and approved the compromise measures of 1850, including the act for the organization of the Territory of Utah, with the hope and in the confidence that the inhabitants would conform to the constitution and laws, and prove themselves worthy, respectable and law-abiding citizens. If we are permitted to place credence to the rumors and reports from that country, (and it must be admitted that they have increased and strengthened, and assumed consistency and plausibility by each succeeding mail,) seven years experience has disclosed a state of facts entirely different from that which was supposed to exist when Utah was organized. Under this view of the subject, I think it is the duty of the President, as I have no doubt it is his fixed purpose, to remove Brigham Young and all his followers from office, and to fill their places with bold, able, and true men, and to cause a thorough and searching investigation into all the crimes and enormities which are alleged to be perpetuated daily in that Territory, under the direction of Brigham Young and his confederates; and to use all the military force necessary to protect the officers in the discharge of their duties, and to enforce the laws of the land. [Applause.] , When the authentic evidence shall arrive, if it shall establish the facts which  are believed to exist, it will become the duty of Congress to apply the knife and cut out this loathsome, disgusting ulcer. [Applause.] No temporizing policy – no half-way measure will then answer. It has been supposed by those who have not thought deeply upon the subject, that an act of Congress prohibiting murder, robbery, polygamy, and other crimes, with appropriate penalties for those offences, would afford adequate remedies for all the enormities complained of. Suppose such a law to be on the statute book, and I believe they have a criminal code, providing the usual punishments for the entire catalogue of crimes, according to the usages of all civilized and christian countries, with the exception of polygamy, which is practiced under the sanction of the Mormon church, but is neither prohibited nor authorized by the laws of the Territory., Suppose, I repeat, that Congress should pass a law prescribing a criminal code and punishing polygamy among other offences, what effect would it have – what good would it do? Would you call on twenty-three grand jurymen with twenty-three wives each, to find a bill of indictment against a poor miserable wretch for having two wives? [Cheers and laughter.] Would you rely upon twelve petit jurors with twelve wives each to convict the same loathsome wretch for having two wives? [Continued applause.] 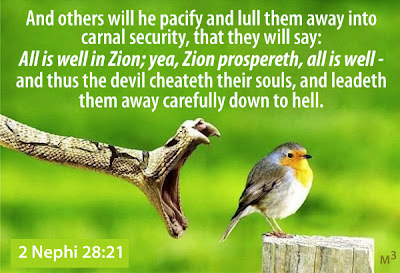 Would you expect a grand jury composed of twenty-three ”Danites” to find a bill of indictment against a brother ”Danite” for having, under their direction, murdered a Gentile, as they call all American citizens? Much less would you expect a jury of twelve ”destroying angels” to find another ”destroying angel” guilty of the crime of murder, and cause him to be hanged for no other offence that that of taking the life of a Gentile! Thus it will be seen that, under the plan proposed, Brigham Young and his confederates could be apprehended and brought for trial” to Iowa or Missouri, California or Oregon, or to any other adjacent State or territory, where a fair trial could be had, and justice administered impartially – where the witnesses could be protected and the judgment of the court could be carried into execution, without violence or intimidation. I do not propose to introduce any new principles into our  jurisprudence, nor to change the modes of proceeding or the rules of practice in our courts. I only propose to place the district of country embraced within the territory of Utah under the operation of the same laws and rules of proceeding that Kansas, Nebraska, Minnesota, and our other Territories were placed, before they became organized Territories. The whole country embraced within those Territories was under the operation of that same system of laws, and all the offences committed within the same, were punished in the manner now proposed, so long as the country remained ”under the sole and exclusive jurisdiction of the United States;” but the moment the country was organized into territorial governments, with legislative, executive and judicial departments, it ceased to be under the sole and exclusive jurisdiction of the United States, within the meaning of the act of Congress, for the reason that it had passed under another and a different jurisdiction. Hence, if we abolish the territorial government of Utah, preserving all existing rights, and place the country under sole and exclusive jurisdiction of the United States, offenders can be apprehended, and brought into the adjacent States or Territories, for trial and punishment, in the same manner and under the same rules and regulations, which obtained, and have been uniformly practiced, under like circumstances since 1790., If the plan proposed shall be found an effective and adequate remedy for the evils complained of in Utah, no one, no matter what his political creed or partizan associations, need be apprehensive that it will violate any cherished theory or constitutional right, in regard to the government of the Territories. It is a great mistake to suppose that all the territory or land belonging to the United States, must necessarily be governed by the same laws and under the same clause of the Constitution, without reference to the purpose to which it is dedicated or the use which it is proposed to make it. While all that portion of country which is or shall be set apart to become new States, must necessarily be governed under and consistent with that clause of the Constitution, which authorizes Congress to admit new states, it does not follow that other territory, not intended to be organized and admitted into the Union as States, must be governed under the same clause of the Constitution, with all the rights of self-government and State equality. For instance, if we should purchase Vancouver’s Island from Great Britain, for the purpose of removing all the Indians from our Pacific Territories, and locating them on that Island, as their permanent home, with guarantees that it should never be settled or occupied by white men, will it be contended that the purchase should be made and the island governed under the power to admit new States when it was not acquired for that purpose, or intended to be applied to that object? Being acquired for Indian purposes, is it not more reasonable to assume that the power to acquire was derived from the Indian clause, and the island must necessarily be governed under and consistent with that clause of the Constitution which relates to Indian affairs. Again, suppose we should deem it expedient to buy a small island in the Mediterranean or Carribean sea, for a naval station, can it be said, with any force or plausibility, that the purchase should be made or the island governed under the power to admit new States? On the contrary, is it not obvious that the right to acquire and govern in that case is derived from the power ”to provide and maintain a navy,” and must be exercised consistent with that power. So if we purchase land for forts, arsenals, or other military purposes, or set apart and dedicate any territory, which we now own, for a  military reservation, it immediately passes under the military power, and must be governed in harmony with it. So, if land be purchased for a mint, it must be governed under the power to coin money: or, if purchased for a post-office, it must be governed under the power to establish post-offices and post-roads; or, for a custom house, under the power to regulate commerce; or, for a court house under the judicial power. In short the clause of the Constitution under which any land or territory, belonging to the United States, must be governed is indicated by the object for which it was acquired and the purpose to which it is dedicated. So long, therefore, as the organic act of Utah shall remain in force, setting apart that country for a new State, and pledging the faith of the United States to receive it into the Union so soon as it should have the requisite population, we are bound to extend to it all the rights of self-government, agreeably to the clause of the Constitution, providing for the admission of new States. Hence the necessity of repealing the organic act, withdrawing the pledge of admission, and placing it under the sole and exclusive jurisdiction of the United States, in order that persons and property may be protected, and justice administered, and crimes punished under the laws prescribed by Congress in such cases. , While the power of the Congress to repeal the organic act and abolish the Territorial government cannot be denied, the question may arise whether we possess the moral right of exercising the power, after the charter has been once granted, and the local government organized under its provisions. This is a grave question – one which should not be decided hastily, nor under the influence of passion or prejudice. In my opinion, I am free to say there is no moral right to repeal the organic act of a territory, and abolish the government organized under it, unless the inhabitants of that territory, as a community, have done such acts as amount to a forfeiture of all rights under it – such as becoming alien enemies, outlaws, disavowing their allegiance, or resisting the authority of the United States. These and kindred acts, which we have every reason to believe are daily perpetrated in that Territory, would not only give us the moral right, but make it our imperative duty to abolish the territorial government and place the inhabitants under the sole and exclusive jurisdiction of the United States, to the end that justice may be done, and the dignity and authority of the government vindicated., I have thus presented plainly and frankly my views of the Utah question – the evils and the remedy – upon the facts as they have reached us, and are supposed to be substantially correct. If official reports and authentic information shall change or modify these facts, I shall be ready to conform my action to the real facts as they shall be found to exist. I have no such pride of opinion as will induce me to persevere in an error one moment after my judgment is convinced. If, therefore, a better plan can be devised – one more consistent with justice and sound policy, or more effective as a remedy for acknowledged evils, I will take great pleasure in adopting it, in lieu of the one I have presented to you to-night. , In conclusion, permit me too present my grateful acknowledgments for your patient attention and the kind and respectfully manner in which you have received my remarks. Lincoln made a speech in response at the State House in Springfield on June 26, 1857. Although the Republican platform in 1856 denounced the “twin relics of barbarism” of polygamy and slavery, Lincoln himself rarely mentioned polygamy or the Mormons. 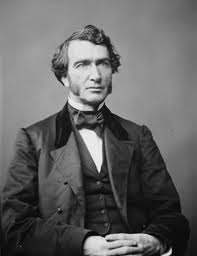 In his speech he used Utah and the Mormon belief in polygamy to attack the popular sovereignty doctrine by which Douglas left up to the people of a territory the issue of slavery. Lincoln wondered why this didn’t also apply to polygamy. Something for the weekend. I couldn’t help but have a little fun on this All Saint’s Day reprising a post on Come, Come Ye Saints, the Mormon Anthem. Catholic me is light years removed from the theology of the Church of Jesus Christ of Latter Day Saints, but I have always admired the hardihood of the early Mormons and their descendants I have known have seemed to all major in nice, so as a group I have fond respect for them. After the Republicans took control of Congress in 1860, they acted against both polygamy and slavery. Sponsored by one of the legislative powerhouses of the day, Senator Justin Smith Morill (R. Vt.), the Morill Anti- bigamy Act sailed through Congress and was signed President Lincoln on July 8, 1862. Thereafter Lincoln, acting with his usual wisdom, ignored the Act, instructing General Patrick Edward Connor, commander of Federal troops at Fort Douglas, Utah, not to confront the Mormon leadership over the Act or for any other reason. Lincoln had made clear to Brigham Young that so long as the Mormons in Utah stayed loyal to the Union, he would leave them alone. Young had no intention for the Latter Day Saints to get involved in the immense blood letting on the side of the Confederacy, so a bargain was struck. This tacit understanding remained in force as long as Lincoln lived. Without a doubt, the strangest portion of Illinois history is the sojourn of the Mormons under Joseph Smith at Nauvoo. From 1840-1844 the Mormons developed Nauvoo from a small hamlet called Commerce along the Mississippi River in Hancock County into one of the largest cities in Illinois, with a population of 12,000, rivaling Chicago. Although the stay of the Mormons under Smith in Illinois would eventually end in tragedy, with the murder of Joseph Smith in 1844 at the hands of an anti-Mormon mob, and the Mormons leaving the state in 1845-1846 on their epic trek to build their Zion along the shores of the Great Salt Lake, the Mormons were initially treated hospitably by the State legislature. 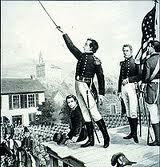 The legislature granted the city of Nauvoo a charter, and authorized the formation of a state militia unit at Nauvoo.